What were the real aims of the Western Powers behind the NATO intervention in Libya in 2011? What inspired the uprising against Colonel Gaddafi that started in Benghazi and that gave France, Britain and the US the opportunity to pose as the saviour of the people? How did NATO get away with transforming the limited mandate from the United Nations for a no-fly zone over Libya into a full-scale bombing campaign and an active collaboration on the ground with the militias that were fighting Gaddafi? And what has really happened in the country since the overthrow and brutal execution of Gaddafi and the ending of his 42-year-old rule? The confusion is not surprising. It stems from the NATO characterisation of their war as a success and “a historic victory for the Libyan people”. The lie that NATO went to war in order to protect the Libyan people must be upheld. This is despite the subsequent killing of an estimated 30,000-50,000 people during the war, the destruction of the infrastructure of the country and the failure of the National Transitional Council and its successor government, the General National Congress, to control the different militias that have sprung up everywhere. The current chaos in Libya, with striking army units blockading oil ports, widespread violence from the militias and with a wave of bombings and kidnappings, goes largely unreported. 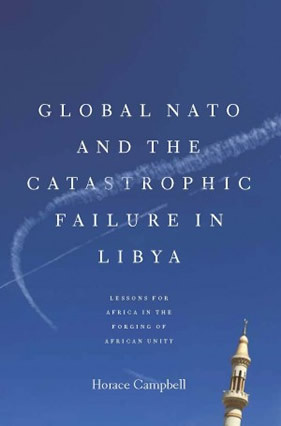 An excellent new account of the war, Global NATO and the Catastrophic Failure in Libya, by Horace Campbell, places the NATO adventure firmly in the context of the global capitalist crisis. Western leaders were looking for an opportunity to intervene in North Africa. They were thoroughly alarmed by the uprisings in Tunisia and Egypt and the possibility that they would lose out to China or Russia in the new global scramble for resources and influence in Africa. Once the Arab Spring spread to Libya, with its vast oil reserves and the largest underground water deposits in the whole of Africa, the imperialist powers, this time led by France, saw the possibility of putting themselves at the heart of these upheavals and of hijacking a popular rebellion. Gaddafi, long demonised by the West after his nationalisation of Western petroleum interests in the 1970s, found himself up against a bit more than a rebellion in the East of the country round Benghazi. Using unfounded fears and rumours, Western powers had persuaded the UN Security Council to intervene and establish a no-fly zone to “help protect civilians”. The UN humanitarian concept of the “Responsibility to Protect” had been meekly put into the hands of warmongers, whose real purpose was to topple Gaddafi, change the regime and integrate Libya (and its oil) fully into the global capitalist set-up. Campbell provides a detailed and all-sided analysis of the build-up to war: the economic crisis driving the Western powers; ever-increasing influence of the financial institutions and oil companies on governments; the tensions within the ruling circles in Libya, with the growth of a neo-liberal tendency that wanted to deal in the capitalist markets; the revolutionary upsurge throughout North Africa which finally spread to the East of Libya where there had been a historic opposition to Gaddafi. Particularly striking in the account is the emphasis given to the importance of the universities and to the intellectuals from the universities in the US, the UK and France – the “scholars” as Campbell calls them – who acted as a sounding board for both Gaddafi and for the Western governments. Gaddafi’s son Saif Al-Islam, who got a doctorate at the London School of Economics, became one of the most zealous of these reformers. Side-by-side with this gradual re-education of Libya’s students, top academics like Anthony Giddens of the LSE, Joseph Nye and other “experts” from the US such as Francis Fukuyama, Richard Perle and Robert Putnam, were taking a keen interest in Libya, arguing that it had been transformed and encouraging much closer dialogue. The author pursues his theory that these scholars played a key role in guiding not only the governments of the West, but also Gaddafi himself who was evidently fascinated by some of their ideas, especially Nye’s ideas on so-called “soft power”. Many of these scholars had travelled back and forth to Libya, to engage more closely with Gaddafi and his circle, none more so than the French self-styled philosopher Bernard-Henry Levy who had the ear of President Sarkozy of France. He claimed to be guiding the rebellion in Benghazi, and advising the French president at the same time. With his Green Book and his support for liberation movements (sometimes misguided as when he supported Idi Amin in Uganda), Gaddafi even tried to spread his ideas internationally, but in the end the ideology underpinning the revolution in Libya where a kind of state capitalism was set up, remained powerless in the face of globalisation, and was isolated. The “reforms” that were implemented after 2003, including a programme of privatisation, increased inequality and strengthened the social layers around the ruling circles. Class differences deepened. The trade unions were not independent and were largely ineffective, living conditions worsened, leading to the alienation of the mass of the people. When the explosion came, seized on and encouraged by the political Islamists and the regionalists in the East of the country, much of the original support for the regime had already evaporated. The oil corporations had remained suspicious of Gaddafi who continued to make rhetorical threats to nationalise the oil industry, while at the same time giving them new exploration and production-sharing contracts. It was these corporations – and the banks of course eagerly eyeing Libyan oil funds and trying to keep their head above water as the world slump gathered pace – that exerted all their powerful influence, directly and indirectly, for war. The book exposes the real forces at work within the Western powers, and how these nations managed to hide their aggressive agenda under the NATO umbrella. It undermines the myth that Western intervention was limited to air attacks alone. American and British special forces were active on the ground, guiding the militias and trying to locate the whereabouts of Gaddafi and his entourage. All kinds of high-tech devices were mustered to try to find him after he had fled to Sirte. His phones were tracked and voice recognition technology was used to confirm that he was there. And above him in the sky were American and French electronic warfare planes that could detect any movement below. Extra drones had been deployed by the Americans. The French claimed to have fired the missile that stopped Gaddafi’s car. It is evident from the account in the book, derived from Gaddafi’s bodyguard who survived and from other sources present as well as from all the mobile phone film and photos put onto the internet, that the operation to capture and execute Gaddafi with another of his sons, was synchronised by Western special forces on the ground. The “Responsibility to Protect” civilians was transformed into a licence to kill them. The last thing that the Western powers wanted was a negotiated settlement. Soon after the African Union announced that Gaddafi was willing to step aside in order to facilitate negotiations, he was indicted with his son by the International Criminal Court in June 2011, and the war went on. “The irony was,” writes Campbell, “that there was an ICC indictment against Gaddafi and his family for crimes against humanity, while NATO accepted the support of the President of Sudan, who had himself been indicted by the ICC in 2009.” As the assault continued, most Arab and African nations, other than US client states like Qatar and Saudi Arabia, distanced themselves from what they rightly saw as a neo-colonialist adventure. The author is right to see the intervention as part of a re-invigorated global scramble for raw materials and profit, but does not attempt to answer or even ask the key questions: What next? Is it possible for the countries of Africa to be independent within a capitalist world? Is the Pan-African perspective of boosting development, eradicating poverty and bringing Africa into the global economy a realistic one within a capitalist world, especially after the experience in Libya? How can the masses in Africa and in Europe be united?